I Got My MoJo Working! Last month, I was just getting started after a long layoff from training due to work demands. This month, the focus is on carrying that newfound inertia forward. The mojo’s coming back. I can already feel some fitness improvements and I WANT to ride and cross train again. Now, I can tell myself to keep up the good work, but I also know it’s time to push it to the next level. I’ve taken the workouts Julie Young gives me on TrainingPeaks, and I’m now in the 75% “getting it done well” range. Not all days are awesome, but at least now I can feel those subtle things that tell me my fitness is coming back. The hip and core exercises she includes in each week’s plan are becoming more doable. I can hold the static positions longer. I also don’t get quite as sore after my workouts. I like that! After more than two years of training with Julie as my coach, you’d think the routine would become boring, but this year she has put some new strength work on the menu. So, now there’s the challenge and interest of learning new exercises. This is where I can really see the benefits of having a coach who spends a lot of time studying different training methods. It’s not just the same old stuff, which would cause even the most dedicated athlete to get bored. In addition to the regular hip, core and cycling workouts, Sundays are endurance days. This is my time for whatever suits my fancy, and these days that’s hiking with my dogs (hey, they were out of shape, too.) I’ve also been super fortunate that these adventures in the mountains outside Reno have been spent with several of Julie’s athletes who happen to be good friends. The camaraderie while training is a huge bonus. Some not-so-subtle clues that we love our training programs and we’re all excited to be working on our fitness… Creek crossings on icy logs include supporting commentary, “Engage your core!” During the uphill sections, we comment on how our glutes feel. Amazing stuff. This mojo… it’s working! http://silversagecenter.com/wp-content/uploads/2014/11/337455_4540309995760_2113637697_o.jpg 1366 2048 julieyoung http://silversagecenter.com/wp-content/uploads/2014/06/SS_14171-Logo-Development-SportsLab-Horz-header-300x83.png julieyoung2014-11-29 13:32:252014-11-29 13:34:20I Got My MoJo Working! After running for many years, the wear and tear on my body was catching up getting to the point where running became increasingly painful. I knew it was time to make a change. With much encouragement from my doctor (or should I say convincing evidence and forceful nagging) that I needed to stop running, I finally purchased my first road bike in May 2014. Wow!! Just wow!! Had I really been missing out on this amazing sport called cycling my whole life? And so began my journey in to the world of cycling. I had so much to learn about cycling I didn’t even know what I didn’t know. Not only that, but I was very eager to improve (quickly I might add, since somehow I inherited my Dad’s competitive nature along with having competed in running for many years) but most especially because now I could push myself with minimal pain. But there was still some pain and this discouraged me. Julie’s name had been given to me by two separate individuals – a sales associate at Scheels and a friend who had a fit with Julie. I kept her name in the back of my mind, and then was recommended a third time when I road with the Reno WheelWomen who suggested I schedule a bike fit after I incessantly complained my legs felt extremely fatigued most of the time. I was convinced so I scheduled a fit. My first impression of Julie was how I felt by her warm and inviting nature. She was kind sincere and listened to my story. I could tell by the way she explained things, as well as her extensive experience in competitive cycling, that she knew what she was talking about. Next, I was put through a series of physical tests so Julie could understand my off-bike range of mobility and strength. She also had me ride my bike on a trainer so she could watch my form in order to correct posture and position. One significant thing she noticed was my foot position on my peddles. I was pedaling with my toes, placing greater demand on my quads and torque on my knee, and taking the powerful hip out of the pedal stroke. In order to correct this, she moved the cleat back, and the foot forward. This made a huge difference when I started riding again as I started powering the pedal with my glutes. This greatly reduced the fatigue and soreness I was experiencing in my quads and hamstrings. I have now begun a training program with Julie to strengthen my trunk and hips, through various exercises. This will help me to better stabilize and hold a neutral pelvis and spine, to better recruit power from my hips, which in turn will continue reducing the fatigue in my quads and hamstrings. I also look forward to this training to increase my cycle efficiency through understanding and practicing correct pedaling technique and drills. All I can say is I’m very grateful for Julie’s knowledge, experience and encouragement. Can’t wait to do my first race in the spring. 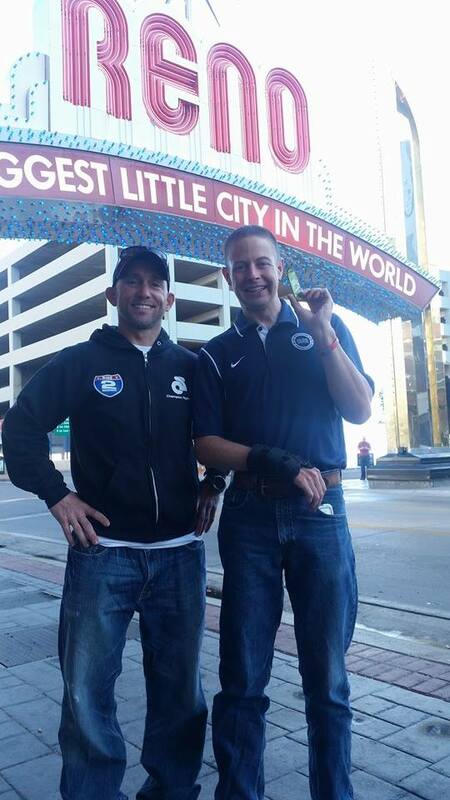 A blog contribution from Tom Crespi, Silver Sage Athlete-Extraordinaire…. There were just 100 yards to go and the two cyclists who’d been battling all week were one and two. The lead cyclist jumped and began sprinting for the line! The other cyclist was able to catch back on behind him and stay in his slipstream. Then the trailing cyclist made a move to come around and fought with every muscle fiber to make it to the finish line first. He won by half a wheel! It’s a scene we have seen played out countless times on television by pro racers. The difference was that winning cyclist was me, a 59 year old competing in the 55-59 age group of the Huntsman World Senior Games in St. George, Utah. Sprinting for a victory in a sanctioned race was something I hadn’t considered when purchasing my first road bike a decade earlier. Four years earlier in this very same road race, my first cycling race ever which I competed in as a lark (invited by a friend to try it), I was a backmarker who was just happy not to finish in last place. I finished a number of minutes behind the winner. This time, the road race win was my second gold medal of the week. Early in 2014, I was looking for some way to boost my performance to a more competitive level using a coach and found Julie through mutual friends. 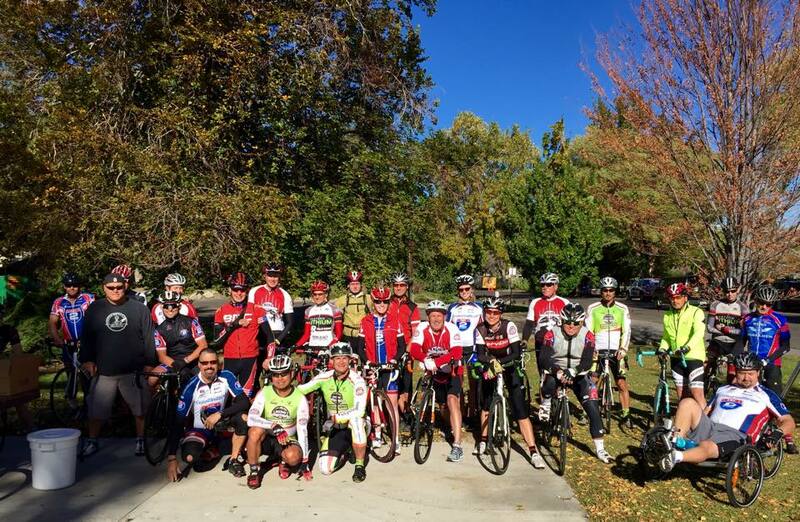 When conversing with Julie, I was impressed when learning that she could offer not just on-bike workouts, but off-bike workouts and mental strategies and tactics too. I decided that was just what I needed and jumped in. As it turns out, every one of these aspects helped (and by the way, her coaching works fine even if you live out-of-state…I live in St. Louis, MO). Leading up to the road race described above were three other races. The first was the Hill Climb. The distance is 5K. For me, it’s torture but thankfully it doesn’t last too long. Riders are disbursed in 30 second intervals and the aim is to get to the top as quickly as you can. Suffice to say that after three previous year’s of battling up this canyon, I won! My fitness from hill training and core work was better and Julie’s tip to keep asking myself if I could go faster was a mental assist as the legs cried out and the lungs were exploding. It was my first win in a cycling race and one I’ll never forget. The second day was the time trial. I hadn’t mentioned that I was riding a rental road bike this year and it was not only a bit smaller frame than my bike at home, but its geometry was not to my liking. Slapping on aerobars increased my discomfort but I made the best of it with a personal best for the 20K distance and a second place. The next day was the criterium and we decided the race plan would include trying to stay up in the top five (this was a 25-30 man mixed age-group field) if possible. 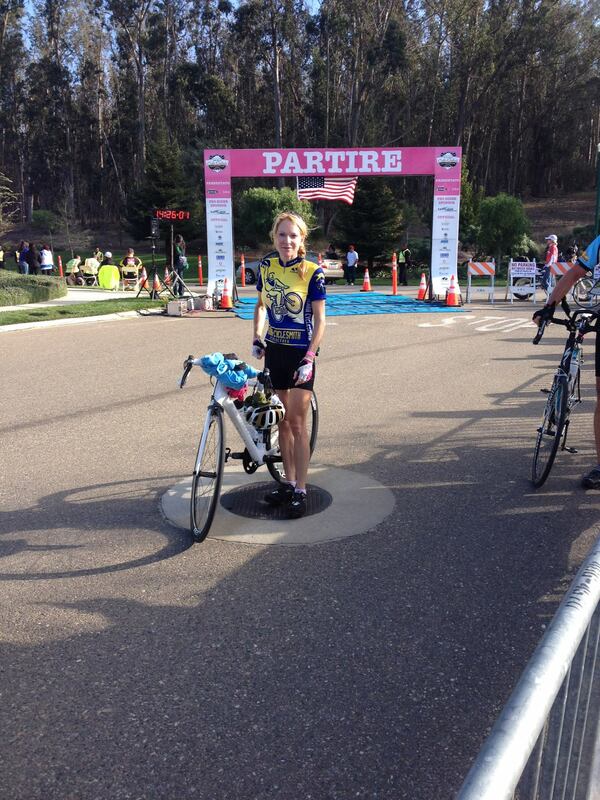 That part worked like a charm, and only at the end was I nicked for the victory by a fellow age-grouper. Going into the fourth and final day, a 24 mile road race, I was in second place for the overall. A strong rider who won the last two days and was third in the Hill Climb (by points: 5-10-10) had me by one point (I was 10-7-7). If either of us got a podium victory we would win the overall. And it turned out storybook. You’re never too old to experience thrills and excitement like sprinting for a race win or simply being competitive enough to be in the mix to possibly make a podium. It takes hard work, sure. But guided by a coach with Julie’s background, dedication and caring concern for her athlete’s not only is anything possible, but improvement of your health and performance is probable. I think I can still get faster and that’s the goal for 2015. I love the fall. It’s my favorite season. The colors are glorious and the temps are perfect for getting out on your bike or strapping on your running/hiking shoes. Fall is also one of my most challenging periods of the year to stay disciplined. Is it yours, too? For myself, it brings with it an intense inner urge to eat loads of comfort food and to nest! I find myself wanting to spend more time perusing the Internet for new recipes than getting out for a ride or run. It also comes at a time of year when all I want to do is ride for fun and not “have to” workout. We have all experienced that at one time or another, right? This is where Julie Young from Silver Sage Sports and Fitness Lab comes in to play a very important role in my life. Julie keeps me on track and in check. Whether it’s via email, texts, or phone calls Julie is right here with me with tons of support, advice, and guidance. And when she personally takes us out on a training ride or holds sessions at the gym I gain so much! A few weeks ago Julie held one of our hands-on sessions that offered first-time instruction for some and review for others. There were a variety of her athletes present. Julie covered the nuts and bolts of cross training for hip, core, glute strength and flexibility. The review, for me, was invaluable. I felt soreness in places I had not felt before and am confident I’m back on track. Julie brings a wealth of experience and knowledge to the mat that is science-based. Regardless of your sport(s), not only will you reap the benefits of Julie, you get to work with one of the nicest persons out there! Thanks Julie! 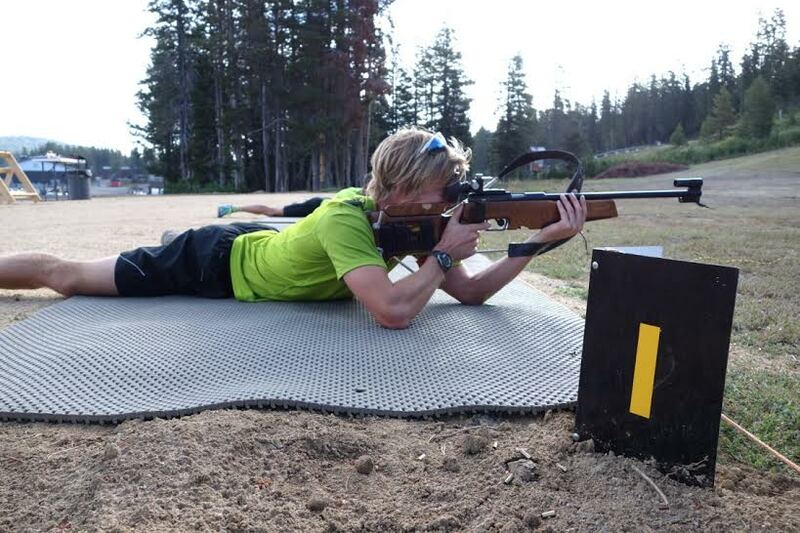 Silver Sage sponsored, Far West Elite XC Ski Team member, and US Biathlon Development Group Member Patrick Johnson is in his final fall preparation phase, and will be on snow and racing within a few weeks. 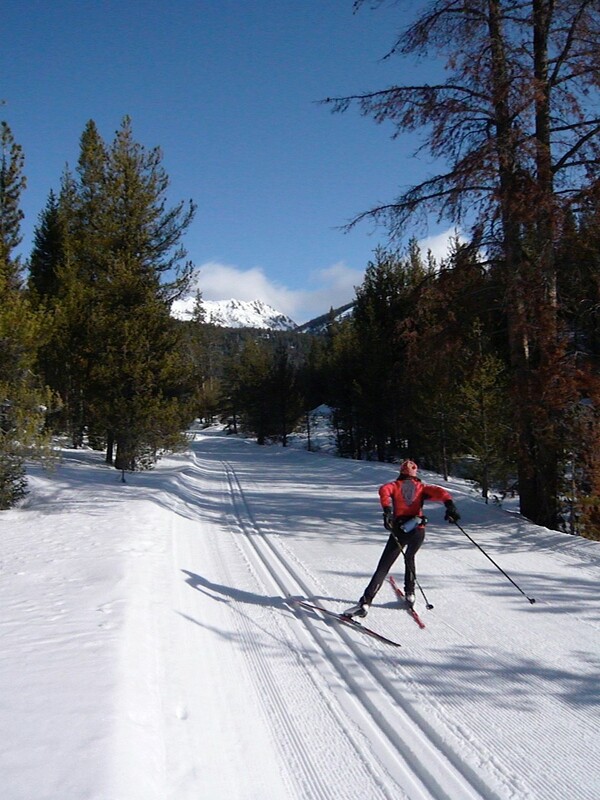 If you are interested in trying out this challenging and exciting sport, Auburn Ski Club’s Winter Biathlon Program has weekly practices for all ages from December through March. 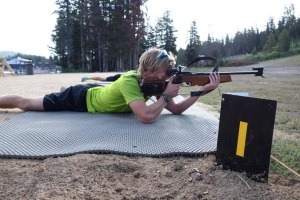 Learn more at http://auburnskiclub.com/biathlon/. O.k., suddenly it’s November. And not only are the days shorter, they just became even shorter as we turned back our clocks. Holidays looming, cold, dark mornings and early sunsets all mean just one thing. After work rides are over. Weekend rides aren’t nearly as long or ambitious as they were just two months ago. I fear my once strong quads have gone the way of down-tube shifters. Being an outdoors junkie and not so much a gym rat I can say that this is pretty much an annual event. Started back in the ski bum days of my youth. 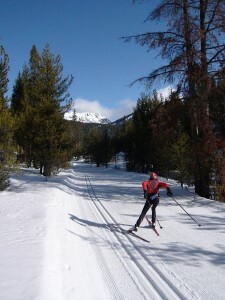 Year after year I hope for an early ski season. Pray that this year I will become more enthusiastic, diligent and focused on riding my trainer. That I will actually use that gym membership I pay for monthly. But inertia is a strong force, and the more I get away from exercise, the harder it is to find that motivation to get back to it. Enter Julie Young, the uber fit and super knowledgeable coach and director for O2 Fitness and Silver Sage Sports and Fitness Lab. I’ve been hearing a lot about Julie from a number of women with whom I cycle. So recently when I had the chance to sign up for her 12-week women’s cycling training group, I decided to go for it. The program consists of daily workouts, which I receive by email. The workouts themselves are a combination of endurance (cycling or running), core stabilization, strengthening, stretching and foam rolling and hip activation exercises. They are varied and specific, with attention to form and technique. Julie understands that it’s all about translating those exercises to function. She really gets that part. I am now starting on week three of the program. Have I been 100% compliant? Not quite. Have I managed to a least do part of the workout or a modification of it just about every day? Yes! Am I feeling stronger? I believe so. I also know that my knee is feeling a lot better. 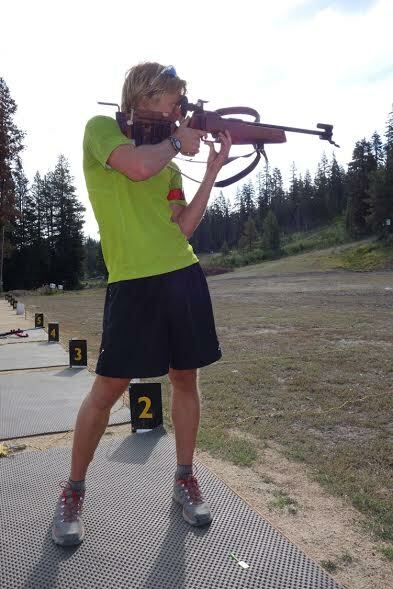 And I know that these exercises are foundational training for the sports that I love. So not only are they helping me get through the dreaded off-season without losing all of my fitness, they should actually make me a better cyclist and skier. That’s motivation enough for me. Reno, NV (November 4, 2014) — Girls on the Run – Sierras has partnered with Race 178 for the first women-specific running event in Northern Nevada. The Run with the Girls 5K will take place at Bartley Ranch on Sunday November 16. “We’re excited to offer a new race and support a program that strengthens girls through running,” said Eric Lerude, of Race 178, which will donate a portion of the proceeds to the non-profit organization. There will be three heats for the event, with the first two open to the public. The untimed Girls on the Run heat, which is the culmination of the 10-week after school program, will start at 10 am for program participants and their adult running buddies. The pre-race expo will take place at Scheels in Sparks, from noon to 5:00 pm on Saturday, November 15, and will include yoga classes, a tutu-making workshop, and a women’s leadership panel. Scheels will contribute $5 per runner to Girls on the Run – Sierras for every participant in the Run with the Girls 5K on November 16, 2014 (up to $5,000). 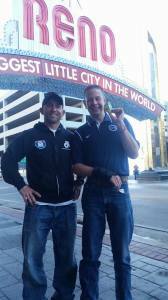 The Girls on the Run program is growing stronger in Reno. The program, which is designed to instill self-esteem in pre-adolescent girls through health education, life skills development, mentoring relationships, and physical training, has inspired girls to be joyful, healthy and confident in the Lake Tahoe region since 2007. “Girls on the Run has changed my life and how I feel about myself and other girls,” said Paloma, age 10. At the request of parents and teachers, the founders brought the popular program to Reno in 2012 with 82 girls participating at six schools. Program enrollment has increased by 50 percent to 124 girls in 2013, with another 50 percent increase to 185 girls in 2014. Girls on the Run is currently empowering girls at five new Washoe County elementary schools this fall: Brookfield School, Bud Beasley, Caughlin Ranch, Mount Rose, and Lois Allen. Returning program sites include Jessie Beck, Roy Gomm, Incline Elementary, Dorothy Lemelson, Elizabeth Lenz, Smithridge STEM Academy and Westergard Elementary. “Girls on the Run is an incredible program because it builds girls’ self-esteem by getting them to be active and helping them reach their goal of doing a 5K race,” said Girls on the Run sponsor Andy Pasternak MD, of Silver Sage Family Medicine and Sports Lab. The 30-hour program meets after school twice a week for ninety minutes. The goals of the program are to develop and improve competence, unleash confidence through accomplishment, develop strength of character, respond to others and oneself with care and compassion, create positive connections with peers and adults, and make a meaningful contribution. The program culminates with the girls being physically and emotionally prepared to complete a celebratory 5K running event. Completing the 5K teaches girls about goal-setting and builds their self-confidence. For more information on Girls on the Run – Sierras and how to volunteer or register for the event, please visit: www.GirlsontheRunSierras.org or call 775-298-0280. Last week, Silver Sage Sports and Fitness Lab sponsored Project HERO athletes had the honor of riding with disabled veteran and US Paralympic Cyclist Steven Peace. Steven was a healthy, U.S. Navy Officer and a bicyclist, riding 200 miles a week. However, on October 16, 2006, one month before his fourth deployment to Iraq/Afghanistan in five years, a massive stroke hit his brain and body leaving him unable to speak, use his arm, or walk independently. With his determination and tenacity, Steven launched a second career in triathlons and cycling. Over two years, Steven has raced in 12 triathlons, culminating in the Oceanside 70.3 Half-Ironman, twice. In cycling Steven has participated in Wounded Warrior Project’s Soldier Rides (12), Ride 2 Recovery Challenges (2), Challenged Athletes Foundation (CAF) Million Dollar Challenge (620 miles in 7 days), won the Para-Cycling US Nationals, and competed in World Cups and World Championships around the world. The highlight of his career was the 2012 Paralympic Games where he placed 5th and 7th. Thank you to all of those that came to hear Steven speak and did not blow away on the ride!